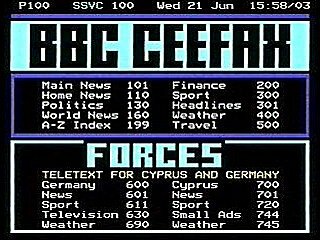 The mother of them all, "See-facts" is the oldest teletext service in the world. 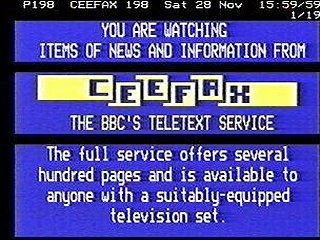 BBC Engineering Information: "CEEFAX was first made known in an announcement by the BBC on 23 October 1972 and experimental transmissions began in March 1973. After extensive collaboration with other interested organisations, a UK unified specification for such an information service was agreed and published. 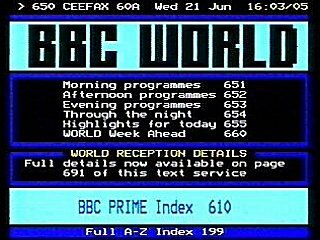 BBC test transmissions changed to the unified standard in April 1974 and an experimental service carrying many different pages, continually updated by a team of editors and researchers began, with the authorisation of the Home Office, on September 23, 1974." 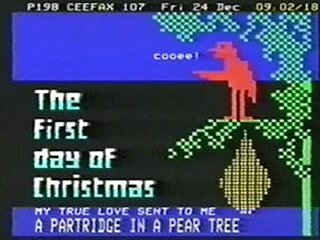 Bob Walker of the BBC: "As far as I remember, the idea for teletext came out of a Graduate Trainee Study Group (a kind of 'think-tank', when we had time for that sort of thing). The idea was originally for subtitling for the hard-of- hearing. I remember it being said that it would only be viable if the cost per set could be less than about �5.00! At the time, that was about 1/16th of my monthly take-home salary. That was in about 1970, possibly 1971. I still have the file in my office, but unfortunately only the cover, which has been re-used. The contents have long since disappeared."